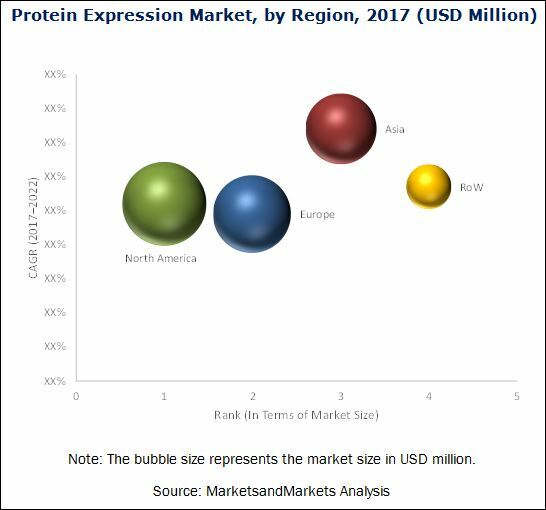 [173 Pages Report] The Protein Expression Market was valued at USD 1,654.0 Million in 2017 and is expected to grow at a CAGR of 11.5% to reach USD 2,850.5 Million in 2022. This report aims to provide insights into the global protein expression market. It provides valuable information regarding the market based on systems type, product, application and end user. Details on regional markets for these segments are also presented in this report. In addition, leading players in the market have been profiled to understand the strategies undertaken by them to be competitive in this market. Protein expression is a technique or methodology in which proteins are characterized, modified, and synthesized in the host cells. The selected protein is typically achieved by the modification or alteration of the protein expression process in a living cell. Various kinds of protein expression systems are used for the production of a broad range of therapeutic proteins such as insulin, interferons, and interleukins. The global market is expected to reach USD 2.850.5 Million by 2022 from USD 1,654.0 Million in 2017, at a CAGR of 11.5% during the forecast period. The rising prevalence of chronic disorders disease, the growing number of life sciences and biopharmaceutical industries, rising research activities on recombinant-based protein expression and technological advancements in protein expression systems are the major driving factors for this market. The protein expression market is segmented on the basis of systems type, product, application and end user. On the basis of systems type, the market is segmented into insect cell expression systems; mammalian cell expression systems; prokaryotic expression systems, yeast expression systems; cell-free expression systems; and algal-based expression systems. The prokaryotic expression systems segment is expected to account for the largest share of the market in 2017. The growth in this segment is primarily attributed to the frequent use of prokaryotic protein expression systems as they are cheaper compared to other expression systems. On the basis of product, the market is segmented into competent cells, expression vectors, instruments, reagents, and services. 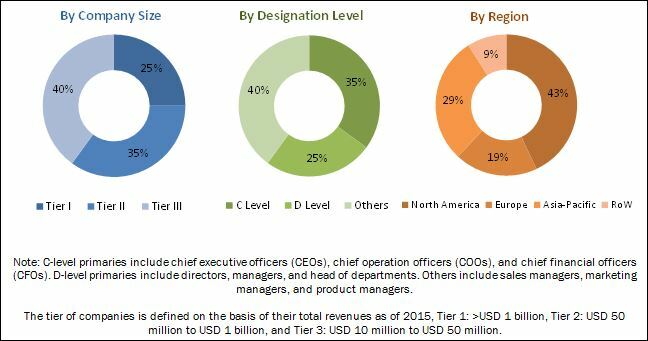 The reagents segment is expected to hold the largest market share of the protein expression market. This is primarily due to the increasing protein expression research activities and the large-scale production of antibodies and vaccines. By application, the protein expression market is segmented into therapeutic applications, research applications and industrial applications. The therapeutic applications segment is expected to account for the largest share of the market in 2017. The growth in this segment is primarily attributed to increasing prevalence of chronic diseases such as cancer and diabetes around the world. Based on end user, the market has been segmented into academic research institutes; contract research organizations (CROs); pharmaceutical and biotechnology companies; and other end users (food processing industry, detergent manufacturers, paper industry, leather industry, breweries, dairy industry, chemical industry, bioplastic industry, and cosmeceutical industry). The pharmaceutical and biotechnology companies segment is expected to dominate the market during the forecast period, owing to technological advancement in protein expression research and the rising production of recombinant therapeutic proteins for disease treatment. By region, the market is segmented into North America, Europe, Asia, and the Rest of the World (RoW). The market is dominated by North America, followed by Europe. However, the Asian region is expected to witness the highest growth during the forecast period. The presence of emerging economies like China and India; rising prevalence of chronic diseases are some of the key factors driving the high growth of this regional segment. The high cost of protein expression instruments & reagents and increasing consolidation in the protein expression are the restraining factors for this market. *Top 25 Companies Analyzed for This Study are - Merck KGaA (Germany), Thermo Fisher Scientific Inc. (U.S.), Becton, Dickinson & Company (U.S.), Agilent Technologies, Inc. (U.S.), Qiagen N.V. (Netherlands), Takara Bio Inc. (Japan), Lonza Group Ltd. (Switzerland), Bio-Rad Laboratories, Inc. (U.S.), Genscript Biotech Corporation (China), Lucigen Corporation (U.S.), Synthetic Genomics Inc. (U.S.), Promega Corporation (U.S.), New England Biolabs, Inc. (U.S.), Sengenics (Singapore. ), Artes Biotechnology GmbH (Germany), Addgene Inc. (U.S.) , Lifesensors Inc. (U.S.), Accelagen Inc. (U.S.), Geneva Biotech (Switzerland), Viva Biotech (China), Profacgen (U.S.), Proteogenix (France), Peak Proteins Ltd. (U.K.), Domainex Ltd. (U.K.), and Jena Bioscience GmbH (Germany). 12.1.1 Thermo Fisher Scientific Inc.
12.1.10 New England Biolabs Inc.